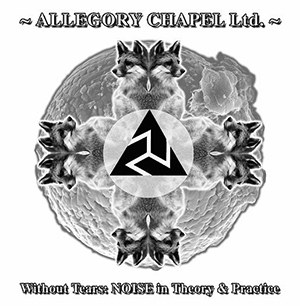 Brainwashed - Allegory Chapel Ltd., "Without Tears: Noise in Theory & Practice"
Allegory Chapel Ltd., "Without Tears: Noise in Theory & Practice"
Elden M's recent resurgence as Allegory Chapel Ltd. has nary taken a pause since reappearing three years ago following an 18 year silence. What might be the most surprising fact, however, is that Without Tears: Noise in Theory & Practice is actually his first full length vinyl release since the project's inception in 1986, amidst a varied array of tapes and CDs. This fact obviously has not been lost on him though, because this album is a comprehensive and cohesive work that covers the full gamut of the ACL sound, from the past to the present, presenting a singular and unique artist and his diverse, complex output. My first exposure to ACL coincided with my first real experience with noise as music, which was the 1995 Japanese/American Noise Treaty compilation. With those limited early days of the internet (and my lack of financial resources as a high school student), I did not have as much of a chance to explore many of these artists beyond that compilation, but the ACL song "Martial Mega-Medley" stuck with me, and I managed to find a used copy of When Angels Fall a few years later. ACL's work had a different edge to it, one that did not fully eschew rhythm or space, but also a wonderfully uncomfortable mood, and I was happy to hear when he resumed activity. Pieces such as "Sedona Walkabout" sit most specifically with his earlier works. There is a pulsating, almost rhythmic underbelly to the buzzing electronics (which seems to be sourced from a guitar cable, given the tell-tale hum). Random voice samples appear throughout, processed and cut up into disturbingly unclear bits to make their source rather disquieting. Flanged electronics and delayed effects result in a constantly shifting, dynamic piece of sound that ends in a nice industrial expanse. "Marin Headlands" is another of the noisier pieces, though starting with a brilliant fake-out: what at first sounds to be a blast of harsh noise wall soon reveals itself to be an ocean side field recording of crashing waves and birds before subtle processing leads to a somewhat less natural. Immediately before Elden M. reappeared as ACL, he released some work as Avellan Cross, a more EBM influenced project, which has clearly bled over into his “main” moniker. In fact, the lengthy "Distributed Organs, Flesh Feedback" could almost be an AC piece, with its thumping 808-like beat and swirling electronics. Guest vocalist Marfisia Bel delivers a spoken word piece over a vaguely house bassline. It is not really a noisy work per se, but the ACL approach to abstract construction still shines through clearly. 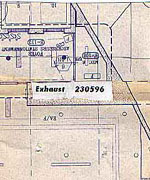 Hints of this conventional electronic music also appear at other moments throughout the record too: "Journey Into Noise" is overall pretty dissonant, but there is an underlying loop that sounds like a destroyed orchestra hit sample that makes for a strange bit of rhythm within an otherwise psychedelic burst of noise. The "Live @ Mata" medley consists of four recent pieces blended together, shifting from engine noise and out of focus shortwave passages into snappy drum machine and back to blasting distortion. He does an exemplary job blending these two extremes of to his sound together, which is all the more impressive coming out of a live setting. By description alone it almost sounds like Elden M. tries to do a bit too much at once on Without Tears, but in truth it is anything but. Instead, the clashing of rhythm and chaos is an exceptionally compelling one, with these occasionally disparate elements managing to gel together perfectly. There is an exceptional blend of the familiar and the unknown to be heard throughout, but presented in a way that comes across as memorable crafted songs rather than just formless experiments or unstructured excursions.